The 300 Internet and Information Technology Position Descriptions include all of the functions within the IT group. Click on the each group below to see a list of jobs included. 4th GL Specialist, 4th GL Specialist Senior, Account Representative, Accountant, Accounting Analyst, Accounts Payable Clerk, Administrative Assistant, Audio Visual Technician, Blockchain developr, Business Analyst, Business Services Analyst, BYOD Support Specialist, Change Control Analyst, Cloud Computing Architect, Competitive Intelligence Analyst, Computer Equipment/Network Analyst, Computer Operator Junior, Computer Operator, Computer Operator Lead, Customer Account Manager, Customer Service Coordinator, Data Analyst, Data Center Facility Administrator, Data Entry Clerk, Data Security Administrator, Database Specialist, Desktop Specialist, Desktop Technician, Disaster Recovery Coordinator, E-Commerce Specialist, Enterprise Architect, Enterprise Resource Planning (ERP) Architect, Enterprise Resource Management (ERP) Business Analyst, Enterprise Resource Planning (ERP) Data Architect, Enterprise Resource Management (ERP) Decision Support Analyst, Enterprise Resource Planning (ERP) - developr, Enterprise Resource Planning (ERP) Functional Lead, Enterprise Resource Planning (ERP) Infrastructure Administrator, Enterprise Resource Planning (ERP) Master Data Analyst, Enterprise Resource Planning (ERP) Process Owner, Enterprise Resource Planning (ERP) Security Administrator, Enterprise Resource Planning (ERP) Security Analyst, Enterprise Resource Management (ERP) Subject Matter Expert, Enterprise Resource Planning (ERP) Team Lead, Enterprise Resource Planning (ERP) Technical Lead, Enterprise Resource Planning (ERP) Trainer, Executive Secretary, Forms and Graphics Designer, Hardware Installation Coordinator, Help Desk Analyst, Help Desk Technician, Human Resources Generalist, Human Resources Specialist, Internet developr, Internet/Intranet Administrator, Information Assurance Analyst, Information Technology Associate, IT Planning Analyst, IT Security Engineer, Key Performance Indicator Analyst, LAN Applications Support Analyst, Librarian, Maintenance Contract Administrator, Media Librarian, Metrics Measurement Analyst, Network Administrator, Network Control Analyst Assistant, Network Control Analyst, Network Engineer, Network Security Analyst, Network Services Administrator, Network Specialist, Network Technician, Network Specialist Senior, Object Programmer, Object Programmer Senior, On-Line Transaction Processing Analyst, Operations Analyst, Operations Analyst Senior, Operations Training Coordinator, Pandemic Coordinator, PCI-DSS Coordinator, Personal Computer Specialist, Planning Integration and Control Administrator, POS Coordinator, POS Hardware Coordinator, POS Senior Coordinator, Print Operator, Procurement Assistant, Procurement Coordinator, Production Control Analyst, Production Control Analyst Senior, Production Control Specialist, Programmer/Analyst, Programmer Assistant, Programmer, Programmer Senior, Quality Measurement Analyst, Security Architect, Software Engineer, Software Quality Control Tester, Staff Accountant, Systems Analyst, Systems Analyst Senior, Systems Integrator, Systems Programmer, Systems Programmer Senior, Systems Support Specialist, Systems Support Specialist Senior, Tape Librarian, Technical Services Specialist, Technical Specialist, Technical Specialist Senior, Telecommunications Technician, UNIX Programmer, UNIX Programmer Senior, Voice Communications Coordinator, Voice Communications Specialist, Voice Wireless Communications Coordinator, Web Analyst, Web Site Designer, Wireless Coordinator, Word Processing Operator, and Word Processing Lead Operator. You can purchase this book as a PDF Book, Word Book or as individual word files for each Job Description which makes for easier modification. We have also combined the both book formats with the individual word files for each job descriptions to give you the best of both worlds. 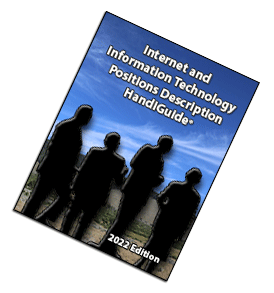 The Internet and IT Job Descriptions comes in PDF format The PDF book is over 800 pages in length and contains 300 Job Descriptions in addition to a Job Progression Matrix Template, Employee Termination Checklist (Electronic Form), Job Evaluation Questionnaire, and Position Description Questionnaire. Includes positions from CIO, CSO and CTO to Wireless and Metrics Mangers. All of the positions in the book have been created to reflect the technology world of . pdf file can be printed and viewed only. 300 Internet and IT Job Descriptions as individual files in MS WORD and ePub formats. Long file names have been used to make customization easier. The eReader versions are fully indexed, searchable and work on Kindles, iPads, Android Tablets, and SmartPhones. Each job description is between two (2) to six (6) pages in length and has been created utilizing CSS style sheets. As such they are "out of the box" ready to use with little or no modification other than organization specific customization. The Internet and IT Job Descriptions HandiGuide comes in PDF format and job descriptions as separate MS WORD and ePub files. The PDF book is over 800 pages in length and contains 300 Job Descriptions in addition to a Job Progression Matrix Template, Employee Termination Checklist (Electronic Form), Job Evaluation Questionnaire, and Position Description Questionnaire. 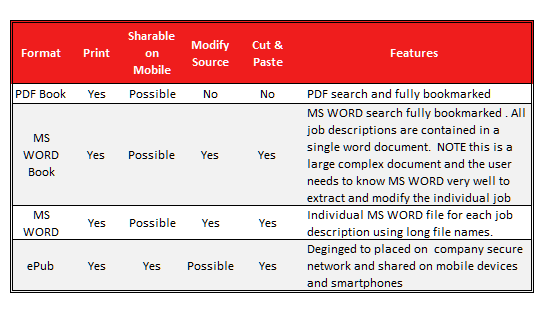 There is one word file for each job description (MS WORD format). Long file names have been used to make customization easier. The Handiguide and job descriptions meet all mandated requirements and are all focused on achieving best practices followed by successful IT organizations in world class enterprises from around the world. This service provides you with updates to each of the products listed below for a period of 12 to 24 months from the date of the purchase of the service. In addition, you may be entitled to some custom job descriptions based on the product ordered. To qualify you have to complete the Position Description Questionnaire (which we will provide to you via email upon your request). It typically will take 5 working days to provide you with the completed job description.